The North East Cell of Daulat Ram College under the aegis of The North Eastern Council hosted its annual fest on 27th January 2017. Mr. Jitendra Singh, hon’ble Minister of State for The Ministry of Development for the North Eastern Region was the Chief Guest for the event. 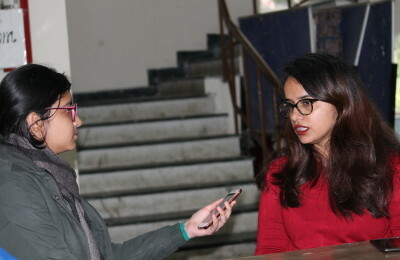 Prior to this inter-college cultural extravaganza, there was an inter-college Poster Making and Collage Making Competition held on the 18th of January 2017,where students from various colleges of Delhi University participated. The topic of both the competitions pertained to the natural and cultural heritage of the North East of India and both the events saw large-scale participation. Students of Daulat Ram College and Ram Lal Anand College brought glory to their colleges respectively by bagging prizes in both the competitions. The award winners of both the competitions were announced on the day of the fest. The eight colourful North Eastern states of India are so rich naturally and culturally and thus people from the eight sister states came together to put up stalls exhibiting the food, ornaments, art and accessories of the region. The cultural programme began with the performance of the traditional Garo dance from Meghalaya by girls of Daulat Ram College. It was followed by the Sikkim-Bhutia dance performed by students from Ramjas College, Daulat Ram College, Maharaja Agrasen College, Amity University, Ambedkar University, Lakshmibai College, Zakir Hussain College and Swami Shraddhanand College respectively. The pretty faces and the silken attire lit up the event. Then, the much awaited Cheraw dance, also known as the bamboo dance from Mizoram was performed by the students of Jesus and Mary College. The amalgamation of 12 bamboos, 6 dancers and the beats of the bamboo was very lively to watch. The Maring War Dance,a tribal war dance form from Manipur was performed by students of St. Stephens College, Shivaji College, Hansraj College, Hindu College, Swami Vivekananda College and Indraprastha College for Women collectively. With vibrant colours and typical tribal get-up the audience got a chance to witness the celebration of tribal art form and the integration of the eight sister states. In the end, the Students’ Union of Daulat Ram College presented special dance performances by Dance India Dance (DID) contestant Suraj Sharma and Rohit Bachi from IIT Bombay. Previous PostMonumental tricolour hoisted at Hans Raj College Next PostDecoding Fashion Society- It’s more than just a strut in stilettos!